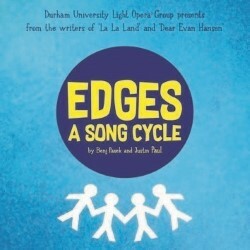 ‘Edges’ returns to the Fringe in a capable production by Fringe veterans DULOG. This is the song cycle made famous by ‘the Facebook song’ and whilst it was originally written in a rush, it was later revised and tidied up by the authors (currently famous for Dear Evan Hansen and La La Land). The cast of four competently handle the songs but we are never sure if the characters are the same throughout or indeed completely different – it is a song cycle, anything goes but we just don’t know in this case. The singing was generally good, especially from the men although there was some straining or weak high notes and occasional dodgy harmonies in the ensemble sections towards the end of the show. My big issue with this production was the sound. At times it was painfully loud, the drums were the quietest thing there with the piano and high girl numbers sounding very bright and overpowering the space. People were wincing at the big belty/shouty moments. But otherwise nice to have a live band, just turn it down and balance the show please. Edges is what it is, a first piece of work from a now-established writing team. It has a few good numbers but the rest aren’t particularly memorable or tuneful.